We’d love your help. Let us know what’s wrong with this preview of The Red Maze by Mark Siegel. R. J. Palacio, #1 New York Times bestselling author of WONDER, hails this adventure series as "Mind-blowingly beautiful. . . . A must-read." Think Star Wars meets Avatar: The Last Airbender ! In book 3, Oona Lee is determined to light Moon Yatta's beacon and continue her quest to save the galaxy. 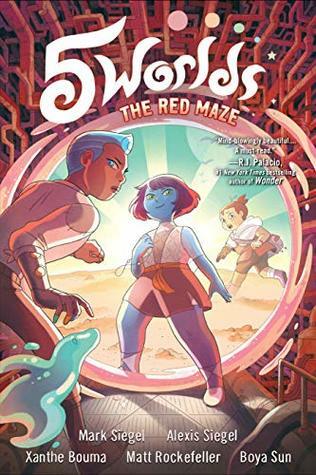 But reaching the red beacon means navigating an impossible maze of pipes an R. J. Palacio, #1 New York Times bestselling author of WONDER, hails this adventure series as "Mind-blowingly beautiful. . . . A must-read." In book 3, Oona Lee is determined to light Moon Yatta's beacon and continue her quest to save the galaxy. But reaching the red beacon means navigating an impossible maze of pipes and facing devious enemies at every turn. Luckily, her friend Jax Amboy has returned from his adventures transformed! Now he must confront the owner of his former starball team, a ruthless businessman who will stop at nothing to get his best player back on the field . . . and who can grant them access to the beacon. Meanwhile, Oona and An Tzu find a mysterious rebel leader and release a surprising power within Oona's magic. Will they make it in time to stop the evil force seeking to rule the 5 Worlds? To ask other readers questions about The Red Maze, please sign up. Do you know when this book is out? I love this series of books!!!! Mark Siegel It comes out May 7, 2019! First off thanks to the publishers for a digital ARC! Oona and her friends explore a new world with new challenges in their quest to light the beacons on all five worlds. The plots developed in the first two volumes intertwine and deepen when confronted by a less overt manifestation of the Mimic. Big changes are in store for Jax and An Tzu as the band of friends overcomes difficulties separately and meets a different kind of sand dancer. Oona learns some problems require less physical strength an First off thanks to the publishers for a digital ARC! Excellent artwork and story. In this third installment, Oona is tasked with lighting the red beacon. We get a glimpse of Jax Amboy’s life as a starball player. A fascinating band of rebels help Oona face one of her toughest challenges within herself. Thank you so much to the publisher for letting me access an advance review copy. Mark Siegel was born in Ann Arbor, Michigan, grew up in Paris, France, and now lives in New York. A graduate of Brown University, he is the author and illustrator of several award-winning picture books, including the graphic novel, SAILOR TWAIN, and the 5 WORLDS series. Mark is also founded First Second Books—Macmillan's prestigious graphic novel publisher.